When you want to add sparkle to every occasion, this hamper experience guarantees to impress. 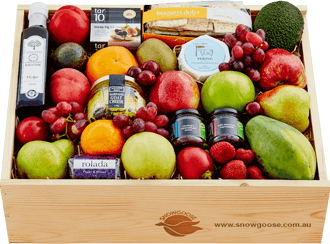 We handpick a selection of Snowgoose fruits, renowned for their orchard aromas and exceptional fresh flavours, and beautifully display them in our iconic wooden box. 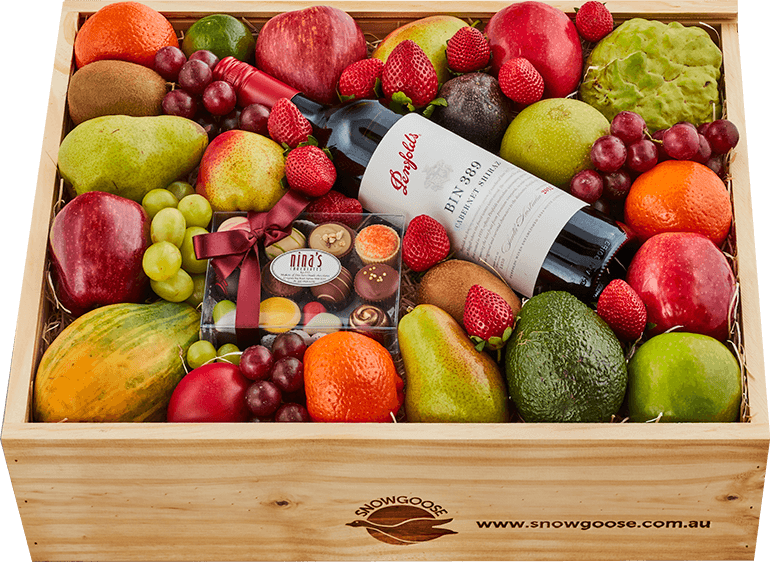 We have chosen Penfold's BIN 389 Cabernet Shiraz to complement the sumptuous produce. BIN 389 is matured in the same barrels that held the previous vintage of Grange and exemplifies the judicious balance of fruit and oak. To complete the gourmet treat, a personal selection of Nina's handmade Belgian chocolates delights the eyes as much as the taste buds. Thoughtful and generous, this deliciously unique gift idea remains one of our all-time bestsellers. This Gift of Taste features orchard-fresh produce. Enter your postcode here to check we can deliver it to your address. Our delectable fresh fruits are simply the stars of the crop! That's because we handpick them from the trees at exactly the moment they're at their best. Crunchy, sweet, large and juicy, we're famous for delivering mouthwatering flavours rushed straight from the orchards and growers and into each beautiful hamper we lovingly prepare. How delightful to know that when a gift arrives, each recipient will be able to indulge in amazing fruit that was on the tree just 48 hours beforehand! Visit Nina’s Chocolates in Gymea, and you’ll discover (like we did) molten waterfalls of exquisite chocolate and creations that resemble edible art. Master chocolatier George Magganas believes the chocolate experience begins with eating with your eyes, followed by the taste sensation that instills a sense of wonder. Using a base of imported Belgian couverture, George's 150 different chocolates have won over 100 awards. Lucky us! It has been an absolute pleasure tasting and selecting these for your recipient. Penfolds was founded by Christopher Rawson Penfold and Mary Penfold in 1844. It is one of Australia's oldest wineries, and is currently part of Treasury Wine Estates. During the 1940s and 1950s, the company started producing table wines to accommodate changing tastes. The time spent by Penfolds' chief winemaker, Max Schubert, in Bordeaux eventually led to the production of Penfolds' and Australia's most famous wine, "Grange Hermitage", later renamed "Grange". In the 1960s the company introduced a series of red wines: Bin 389, Bin 707, Bin 28 and Bin 128, that became the highlights of the Penfolds brand. Our stylish extravaganza of artisan luxuries has been hand selected for its heavenly complementary flavours. 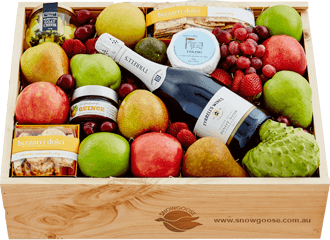 The foundation of this gift hamper experience is our famous Snowgoose fruit, handpicked at the point of perfection. A bottle of Pinot Noir Chardonnay Brut from the Tyrrell family's historic Hunter Valley vineyard provides celebratory sparkle - the top choice to enjoy with buttery Yarra Valley Yering™ cheese and The Fine Cheese Co. Damson Paste. Adding to the feast, Meredith Dairy's decadent Marinated Goat's Cheese tastes divine spread over handmade Peppery Cheddars and Lavosh from Bizzarri Dolci's kitchen. All in all, it's the ultimate way to help someone seriously unwind and indulge. 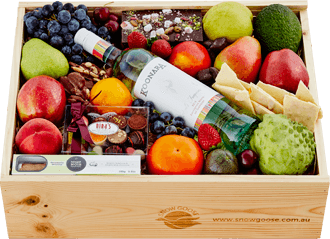 This irresistible selection of our famous fruit, sweet artisan treats and outstanding white wine guarantees to take the taste buds on an adventure. 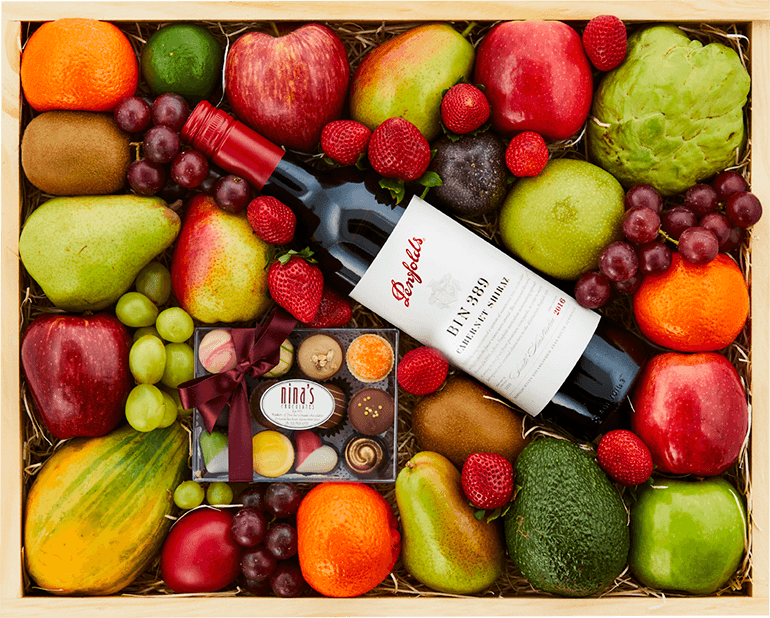 Greeted by a colourful display, your recipient will indulge in the sensational orchard flavours of fruit that arrives within 48 hours of plucking from the trees. In South Australia's Coonawarra, we discovered the Reschke family's Koonara Vineyard. Only a limited quantity of Koonara Angel's Footsteps Sauvignon Blanc is released to the public, making this wine a rare gift to receive. Offering the palate a touch of guava with crisp apple and gooseberry notes, it's the perfect cool climate wine to complement Nina's Turkish Delight chocolate bar. To complete the experience, Nina's master chocolatiers have put together a personal selection of their handmade Belgian chocolates and a generous wrapping of White Chocolate Honeycomb. All in all, it's the most memorable gift to beautifully convey your thoughtfulness.